A cool way to capture your gratefulness. Thank guests with a chic card featuring wedding day photos or honeymoon snapshots. A classic expression of thanks. Match your favorite design to your wedding style by personalizing the colors, fonts, and wording. We ordered these thank you's customized with pictures from our wedding. They turned out beautiful! I was very impressed with Magnetstreet's variety and ability for personalization. I did my Save the Dates, invitations, and Thank yous in the same Floral Ornament pattern. I got many compliments on the style. Shipping was timely. Discounts helped from the codes sent in the shipments for future ordering. Overall I would not change a thing!!!! This is one of the only websites where you can actually choose your colors and see your product on the screen before ordering it! Most you just choose colors and order it and hope for the best. It was exactly what we wanted and the website was super easy to use!! Grab a pen and be inspired with simple phrases and notes you can add into your cards. Add a fun quote or quip to your personalized message in your thank yous. What to say to whom, how to word, and when to send off your Thank Yous. Hoping for cash gifts instead of dishes, or a new vacuum? Here’s a how‑to to help you. After your wedding is over and your newlywed bliss has begun, impress your guests one more time with good manners and impeccable style. Write a thoughtful handwritten thank you to everyone who made your wedding day special! Personalized Thank You Cards allow you to thank guests in your own stylish way. Each design can be personalized on the front, inside and back—giving you plenty of room to share your message of gratitude with each of your guests. Choose a Photo Thank You to display a wedding day or honeymoon pic, or customize one of our Non-Photo Thank You designs. 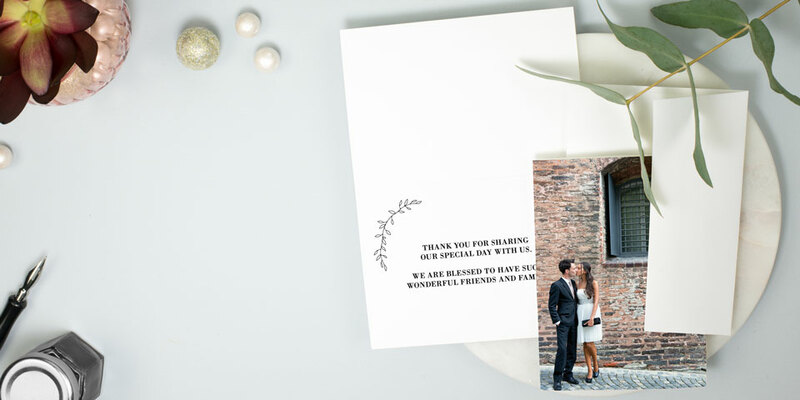 Photo, rustic, destination, vintage, modern, and more—find the perfect Thank You Card to complete your wedding stationery journey!